London. Full of land marks, history, entertainment, restaurants and culture. So where better for a weekend away? Travelling by coach, for us, is the most convenient and cheapest way of getting to the capital. If booked early or on off-peak times, cheap tickets can be found with National Express (although the prices are always very reasonable compared to the train and far easier than driving). Our chosen hotel for the last several trips has been the Hub by Premier Inn. Having searched the internet over and over and staying in more than 10 different hotels in different areas and price ranges of London, The Hub is the best all-rounder. It’s in a perfect location for exploring the city, the staff are friendly and it is very reasonably priced for the location. Travelling around London isn’t as hard as you might think. The touristy part of the city is quite compact, and if you’re up for a walk, is easily accessible. For instance, a walk from Piccadilly Circus to either Buckingham Palace, Covent Garden or Big Ben will take between 15-20 minutes. If walking isn’t for you or the weather takes a turn for the worse, there are plenty of travel options to choose from. An Oyster card will get you travel on various modes of transport including the bus or the London Underground Tube. 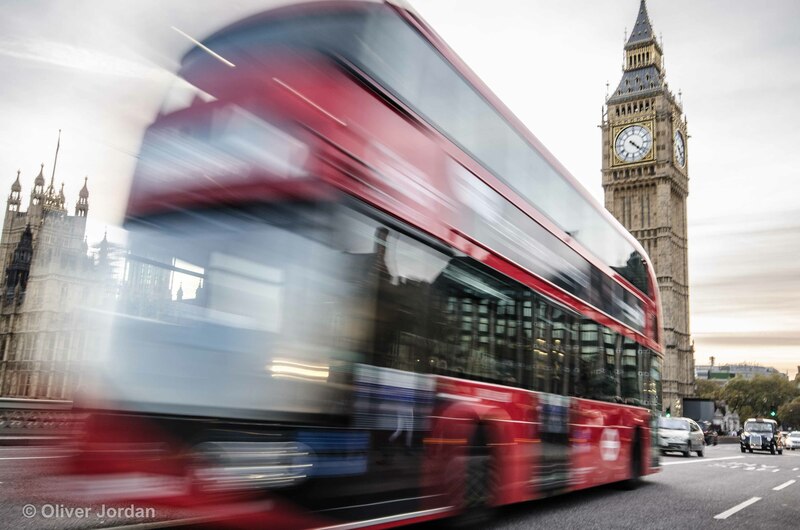 London bus and Big Ben (Elizabeth Tower). 9 times out of 10 we would choose the Tube because the experience is novel and not something that can be done back home in Bristol. 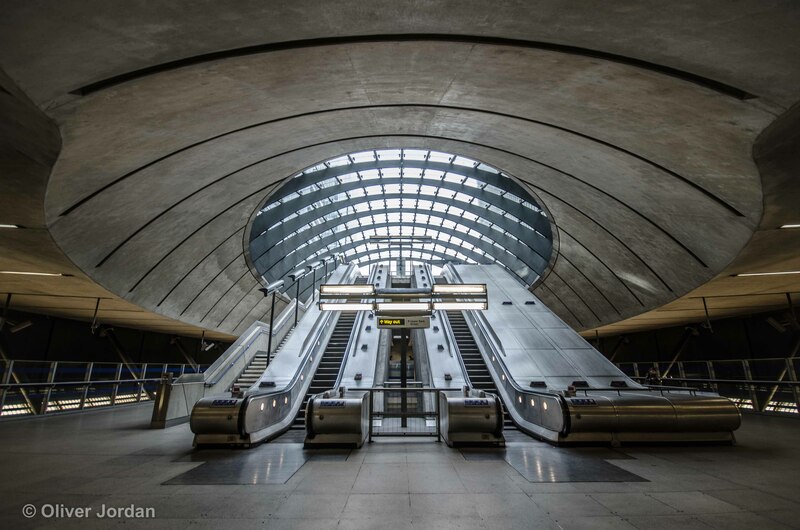 To make the experience of navigating the vast underground a little easier, an app can be downloaded on your phone which allows you to type in where you are and your destination, and in return it will tell you the lines to take and when to switch. 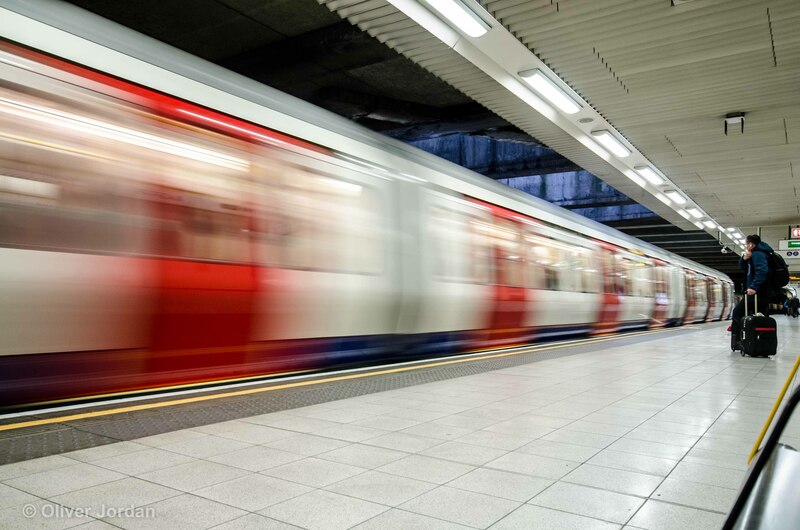 London Underground – Tube station exit. The Underground itself is split into zones. The zones represent different locations and the further out of central London you go, the higher the prices. However, most of the general tourist places are located within zones 1 and 2 keeping the price down. 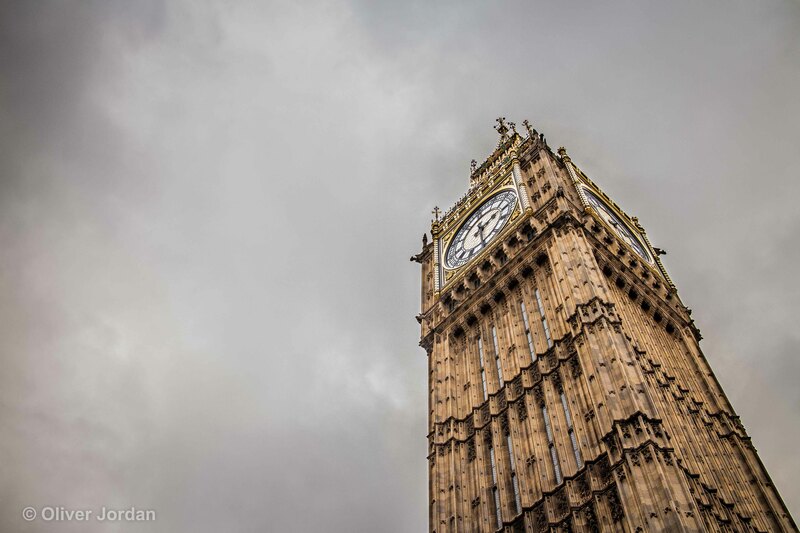 Possibly one the most famous landmarks in London, if not the whole of England is ‘Big Ben’. Big Ben however is the name of the bell and the tower you can see is actually called ‘Elizabeth Tower’. The architecture is fantastic and it is guaranteed that every tourist shop will have some sort of Big Ben memorabilia. We often get stopped whilst wandering London by other tourists asking for directions to this iconic building. Come rain or shine it manages to draw in the crowds with many a selfie being taken next to it. One of the best things about London for me is no matter the weather, there is always something happening. No matter what your interests are, there will be something you will enjoy. 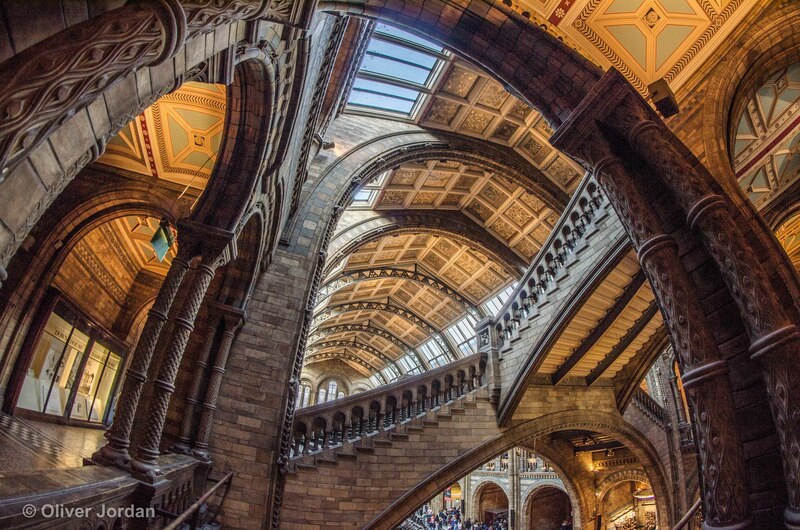 On this particular trip we decided to visit the National History Museum. 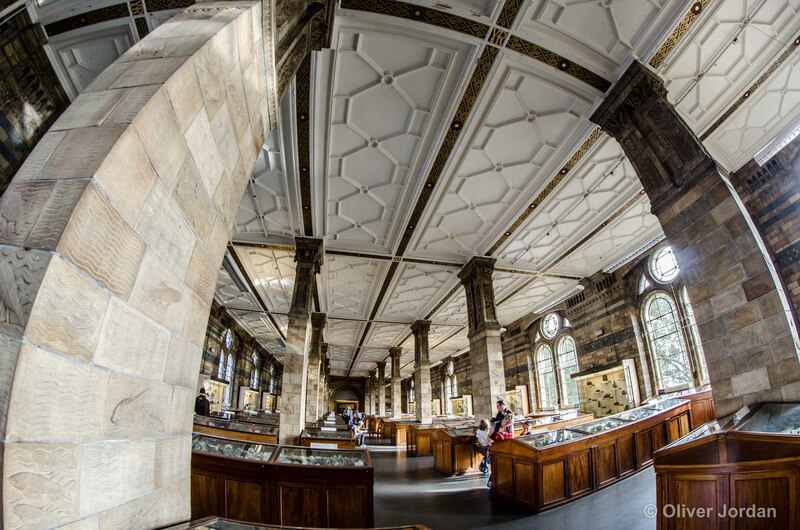 Once again it is a very iconic place and held in high regard as being at the forefront of natural science. However, we forgot one very important part: Half-term. The experience was still brilliant and lived up to our expectations but the crowds of people made it hard to see some of the exhibits. The inside is how you would imagine Hogwarts School from Harry Potter. It had everything from the grand staircases to individually decorated ceiling panels. The amount of information that could be obtained from the museum is incredible! If you wanted to, you could leave a lot more knowledgeable than when you entered. We will certainly be returning again, just not during school holidays! If the weather is nice, a must for anyone visiting London is to take a walk along South Bank. This is a very vibrant part of the city which starts at the London Eye and has a whole host of street artists, food stalls and at Christmas, a festive market. Along the bank are various television studios and it’s not rare to spot the odd celebrity. 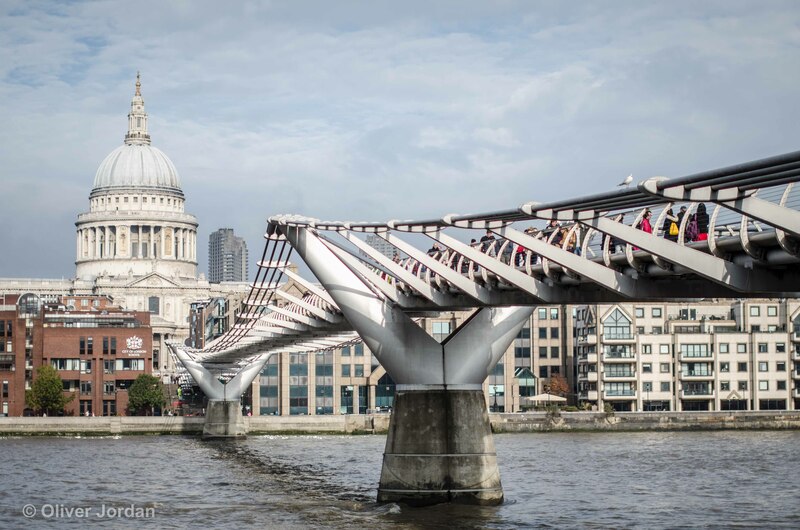 The walk takes you along the River Thames and there are plenty of opportunities to cross the river via bridges. 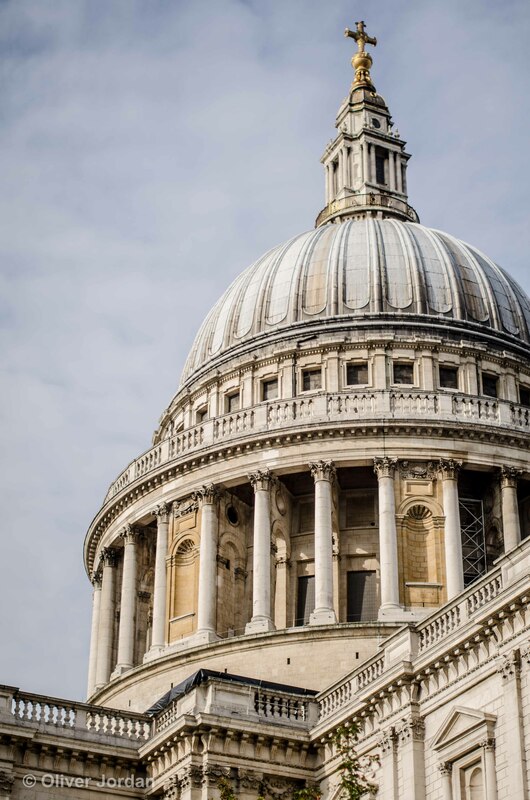 The area around St. Paul’s Cathedral is a perfect midway point to stop, have a coffee and take in some more stunning scenery. If shopping is more your thing, you’ve come to the right place. 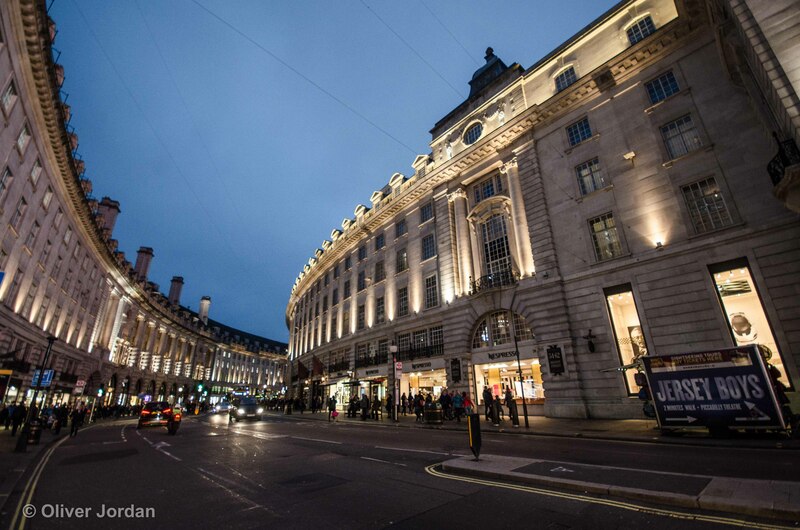 Many of the huge retailers and brands have their flagship stores in London. There are also world-renowned department stores such as the famous Harrods which has become a landmark in itself. Regent Street and the connecting Oxford Street make up probably the busiest/most popular part of all the shopping areas. Adjacent to Regent Street lies Savile Row and Carnaby Street. Depending on whether you’re after the latest fashion or a high-end tailored suit, this would depict the direction you head in. 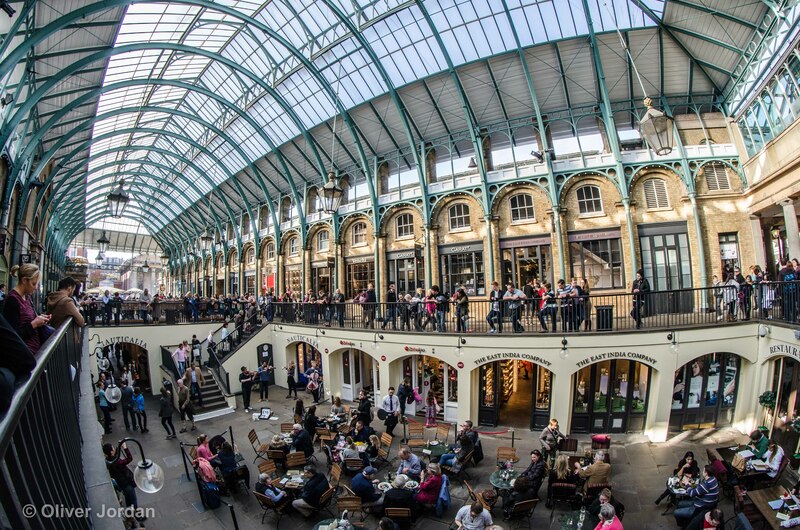 If, on the other hand, you want to visit smaller, quirkier shops, then maybe Covent Garden is the place for you. 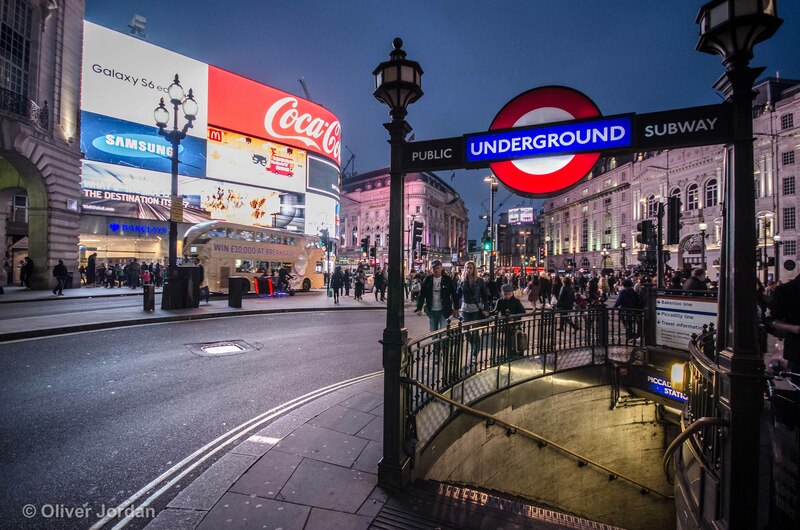 There are a good mix of shops, markets, street acts and food stalls all within a stones throw of Piccadilly Circus. Be warned however, Covent Garden Tube Station has a lot of steps! London is full of interesting shapes and architecture. I have described some of the older architecture that can be found already, but there are also a lot of new sky scrapers and glass fronted tower blocks dotted around. 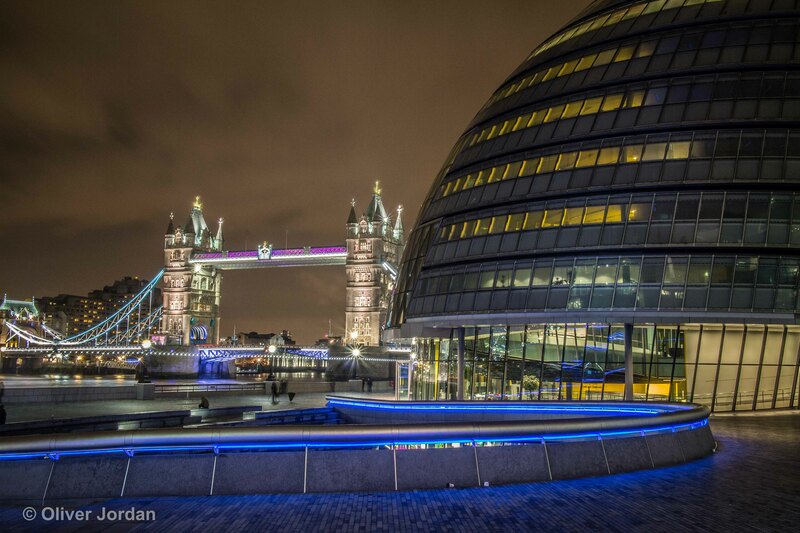 A place called ‘More London’ near the City Hall hosts a collection of these buildings. The shapes and designs are a welcomed contrast to the old style London architecture which can be seen with Tower Bridge adjacent. 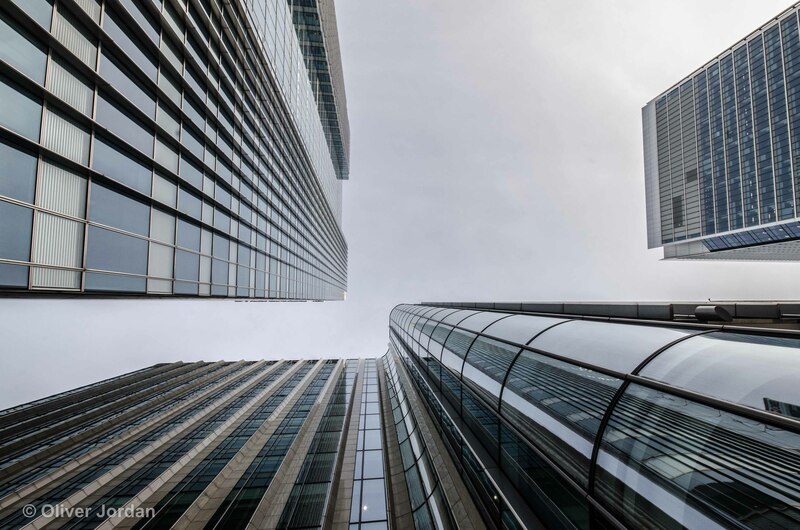 The more modern parts of London such as Canary Wharf skyscrapers are now becoming a huge part of the iconic landscape. The tall buildings tower over the surroundings and it feels like a very different place, but not in a bad way. Just by looking up, you very quickly start to feel quite small and smothered by the surroundings. Canary Wharf is on a flight path and different aircraft are always flying overhead, sometimes quite low. Seeing the different planes between the gaps in the skyscrapers as they make their approach to land at the airports was intriguing. There are plenty of restaurants in Canary Wharf, but if you don’t feel hungry and instead just want to sit and absorb the atmosphere, there are plenty of places to do so. With a lot of the buildings having glass fronts’, it’s hard to avoid reflections. 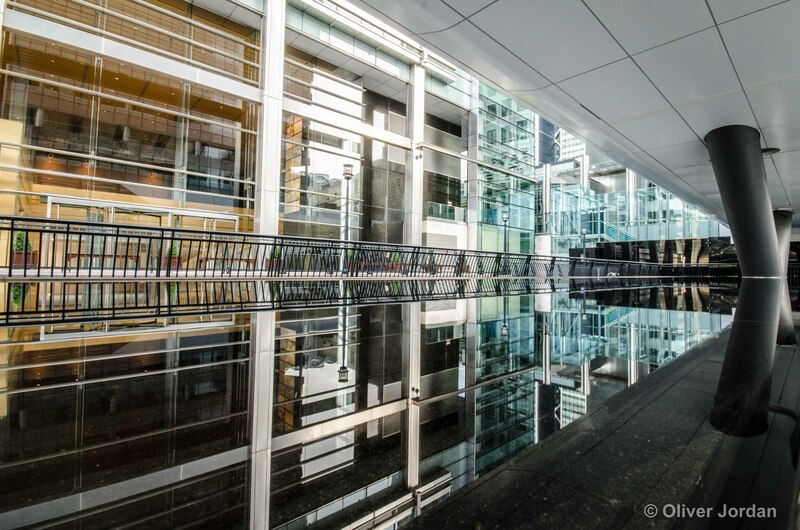 We found a nice place to sit next to a water feature which perfectly mirrored the building next to it. 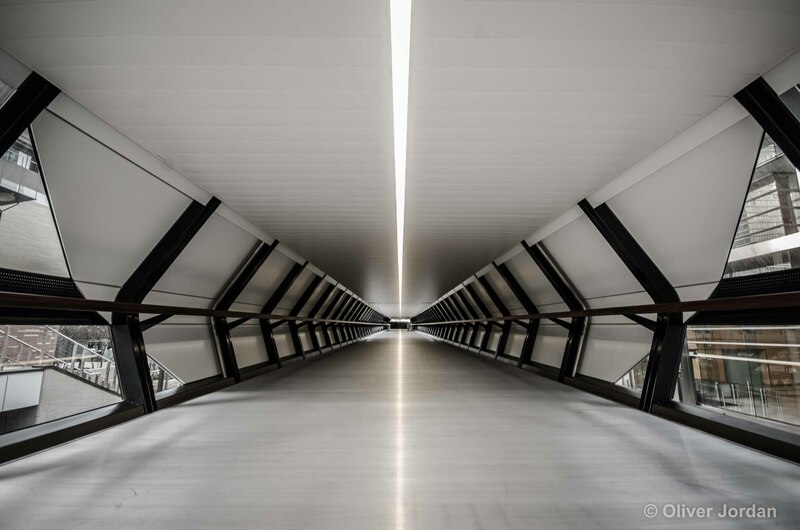 A lot of Canary Wharf has a space age feel about it and even the bridges felt as if you were entering the Star Trek Enterprise. As the sun goes down in London, it does not necessarily mean that it’s time for bed. There are still many things to see and do at night-time. 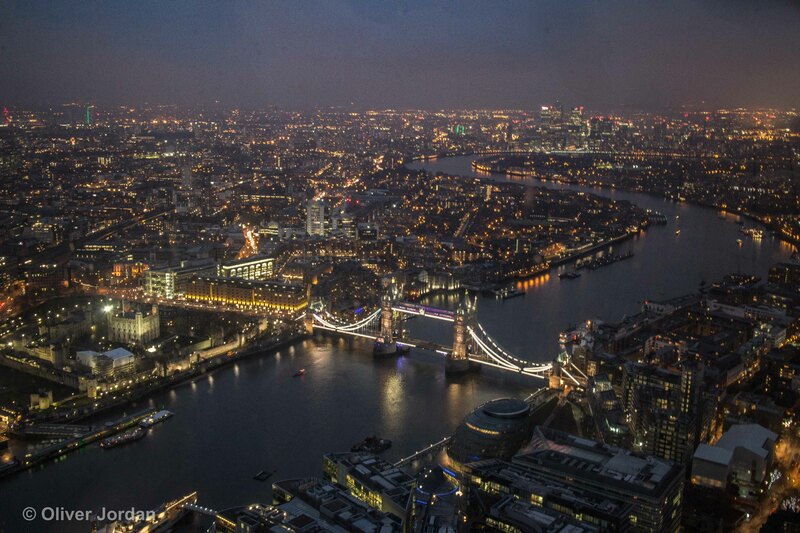 The view from the Shard is a fantastic place to start an evening in London. Once you reach the 72nd floor, which is at a hight of around 800ft, you will be greeted by a whole panoramic view of the city and it even has a bar if you want to get a glass of Champagne. 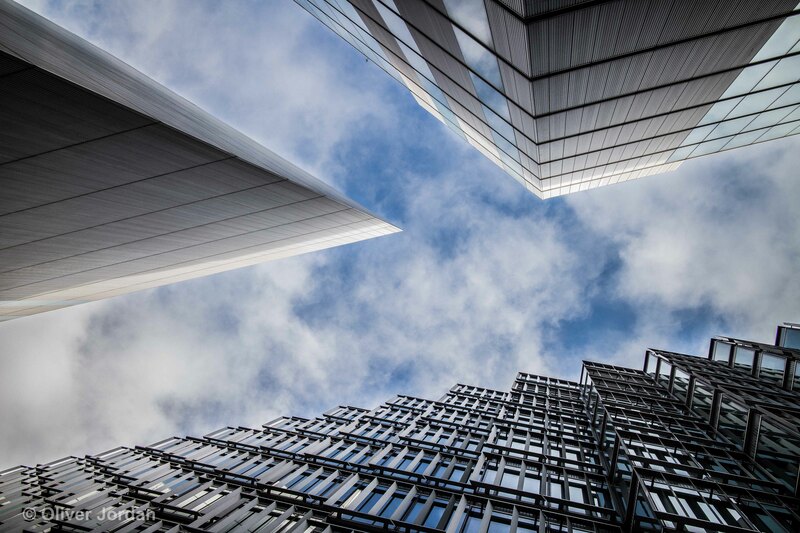 You are able to walk around the entire circumference at the top of the Shard allowing various vantage points for viewing with interactive screens and, there staff on hand to point out the landmarks. Within the Shard there are various restaurants if you want to book a table after the experience. 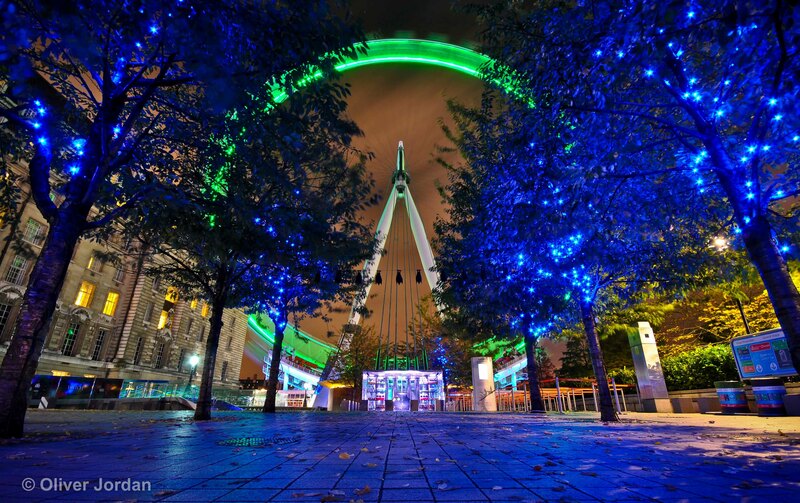 If you still haven’t had your fix of high places, then a visit to the London Eye is in order. 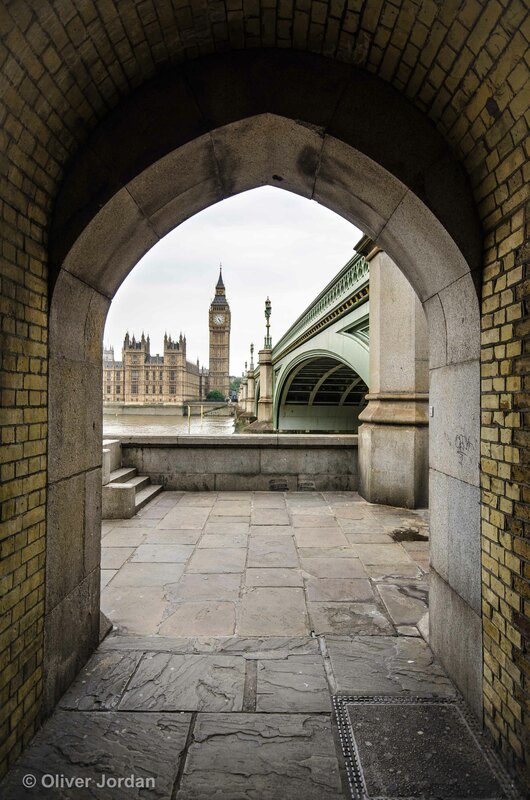 The Eye is a revolving wheel and even though at its highest point, it’s not as tall as the Shard, it still allows some fantastic views, especially over Big Ben and the House of Commons. It is also one of the more modern landmarks of London and a great spectacle to see even if you don’t fancy getting on for a ride. If heights aren’t your thing and you would prefer to keep your feet firmly on the ground, then there are plenty of bars, restaurants, theatres, cinemas and entertainment venues dotted around depending on your taste. 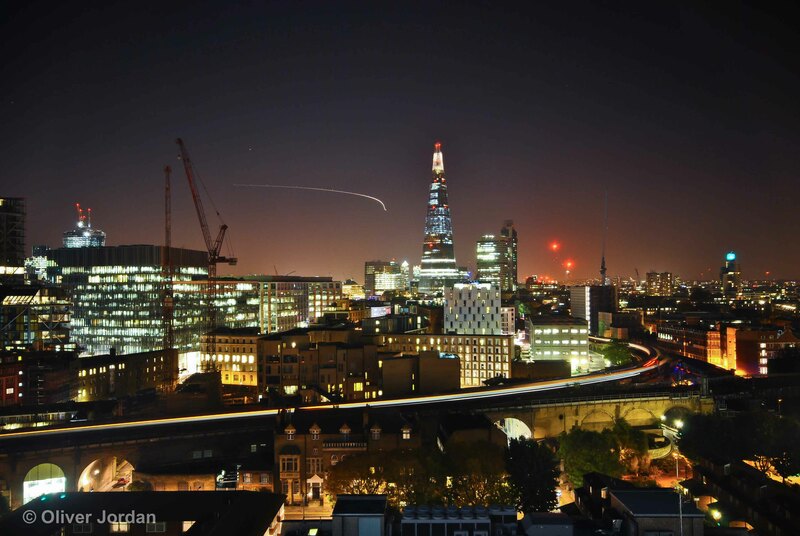 One thing is for sure though, you have to check out the London skyline. PHOTOS ARE COOL..WISH TO VISIT THIS PLACES SOMEDAY. nice pic. hope to visit this city one day.